Louise Swanton is a Contemporary Textile Artist, Designer and Teacher currently based in Mid Wales. Louise grew up in the grounds of Powis Castle, giving her constant inspiration from the natural and historic surroundings which led her into a career in Art. She likes to create unique pieces using a range of traditional to more contemporary techniques. Louise’s most recent work is all about looking closer at nature with childlike wonder. In a world where everyone is always busy and with social media taking over a lot of spare time indoors and outdoors; Louise’s inspiration has been to explore, discover and play. These are thigs that are often taken away from adults. Exploring the building blocks and starting to question how different structures and elements are created. Some of this work is about looking closely at leaves to investigate the different petiole and veins running through them which create structure and provides nourishment to the plant. Louise has transferred these investigations to knitting with thin coated copper wire to represent how the leaf is so fragile, yet has such a sturdy support structure running through it. Other parts of Louise’s work during this project are about discovering how different things like under a microscope. Louise carefully looks through the slides before taking a photograph using a microscope camera. The colours and the intricate structures are then recreated using freehand embroidery. 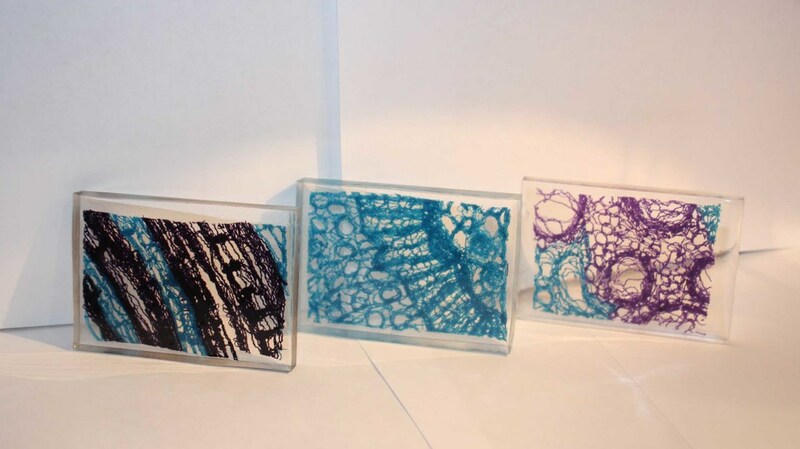 Louise has created sculptures out of these by setting them in resin to replicate the look of the slides more accurately and to display not only the structure, but also the space around these structures. These slides consist of: a Corn Stem, a Stem of Wood and Dicotyledon and a Cucurbits Stem. Louise wants this work to inspire others to go out into the world and start to investigate these beautiful structures that are right under our noses. This work is currently being exhibited at The Qube Gallery, Oswestry. www.louiseswanton.com Louiseswanton@hotmail.co.ukLouise Swanton is a Contemporary Textile Artist, Designer and Teacher currently based in Mid Wales. Louise grew up in the grounds of Powis Castle, giving her constant inspiration from the natural and historic surroundings which led her into a career in Art. She likes to create unique pieces using a range of traditional to more contemporary techniques.